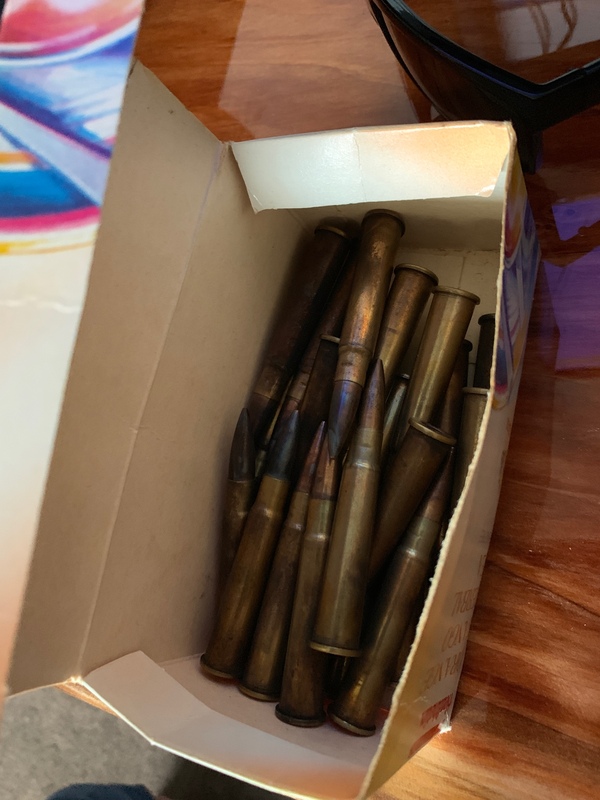 Guys I was sifting through my mother in-laws dead fathers belongings and found a box of 34 rounds in total I’m thinking 303 but don’t know . It has 1942 stamped on the back . His surname being Dansey they served in the war . Don’t know if these are any use to anyone but yeah there on my desk for now . Someone tell us what they are all about. IT might still be cordite powered...but I suspect not....think that went out a fair bit before 1942. Aussie manufactured cordite powered corrosive primed mk v11 .303 Perfect for shooting, just wash out the bore with hot water to get the salt out. Cordite does burn hotter than single based powders due to the nitroglycerine component but unless you shoot hundreds of rounds in rapid sucession it doesn't matter. Hi @metalfix, just shake them and listen. If it rattles it is not Cordite loaded but with some ball powder - see my avatar for what's in a Cordite loaded shell. The straight walled .303 shells were filled with a bundle of spaghetti like cords of propellant, hence the name, and then the neck was bottleneck crimped. The bullet was inserted over a tarry disc to lessen interaction of the hot burning cordite and the lead at the bullet base, so as to reduce bore fouling. MH stands for Military Small Arms Factory No. 3, Hendon, Australia. 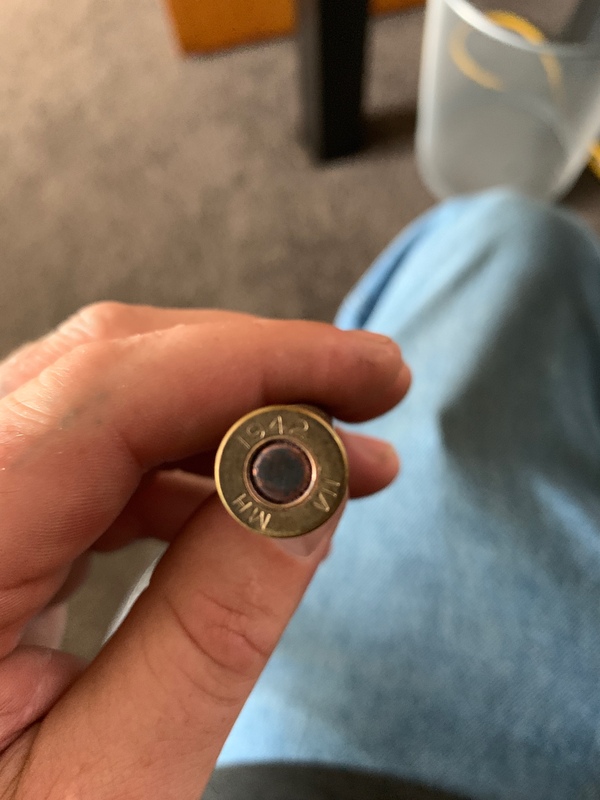 Often nitrocellulose ball powder loaded cartridges were marked VII Z or VIII Z, so the VII on its own indicates a Cordite loaded one, at least for a 1942 one. The bullet is a spitzer with flat bottom, and aluminium core front, lead core rear, sometimes also a wooden tip. 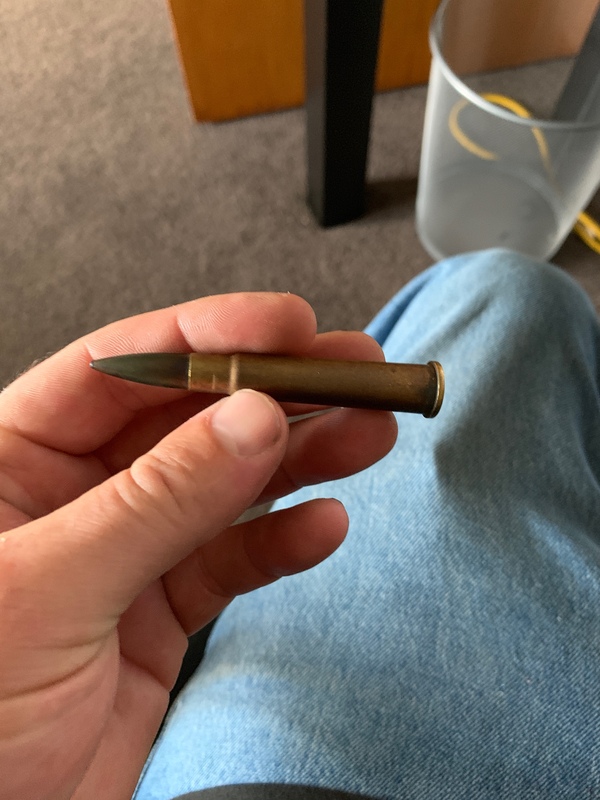 This allowed a lighter 174grain bullet but which still had the full length of the older heavy 215grain, long, round-nosed projectiles, so as to feed well in the same magazines, and also to give the bullet a longer than usual spire tip for its weight. The lighter tip also made the bullet unstable so the fast spin rifling required to stabilise the older long and heavy projectile was just about right for the lighter but more unstable Mk VII spitzer and so was retained. The Lee Enfield has a relative fast twist rate, like the Mosin Nagant family right down to the AK47, due to the expediency of using same tooling, in both cases traced back to the original need to stabilise long heavy bullets. Like all spitzers the Mk VII tumbled on impact -- just the Mk VII did it better than others. The spitzer is arguably nastier than an expanding round nosed "dum-dum" projectile. Some deer cullers used Mk VII ammo, probably the one spitzer bullet you could not argue too hard against for hunting. I read somewhere that the slower .303 Mk VII overtakes 30/06 M1 ball (150grain, also a FB spitzer) somewhere downrange due to the Mk VII's heavier 174grain bullet and long spire tip. The hare beaten by a not-quite-tortoise. I'd just shoot them too. They are not in a collectable box anyway. They may have hang fires/clickbangs, so practice your follow-through, and if a misfire, do count to 30 before you extract. Shooting glasses of course. The Lee Enfield is quite a safe rifle in the way it fails, IF it fails. Bring a small thermos and a small funnel to pour hot water down the barrel afterwards to wash out the potassium chlorate primer corrosive residues (which are water soluble, but NOT oil soluble) and clean as usual. Sure the Cordite erodes the barrel by burning hot, but it's only 32 bullets, and why not feel history kick into your shoulder with granddad's ammo? The old .303 ammo does kick oddly hard compared to, say, HXP Greek .303, maybe it's the nitro sweating, who knows? gadgetman, Tommy and 40mm like this. clickbang...hangfire....with an enfield,point in safe direction,manually recock by pulling striker back with thumb nad forfinger and fire again...this rules out a soft strike on the primer...often round will fire. Thanks for your time on this , I’ll chase a lee Enfield. I shook the case and nobody home .